The school uniform for children in Junior Infants up to 2nd class is a red sweatshirt with the school logo printed on it, a white polo shirt and either navy trousers or a skirt or pinafore. 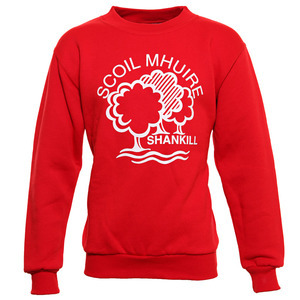 The children in 3rd – 6th class wear our red v-neck Scoil Mhuire jumper with, again with a white polo shirt and either navy trousers or skirt. 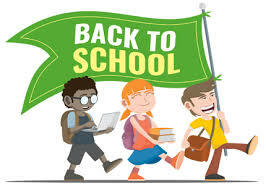 Children should wear black or navy school shoes. All shoes should have Velcro fastenings in the Infant classes. 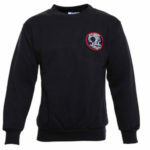 For all classes, the PE tracksuit is navy with a white polo shirt. 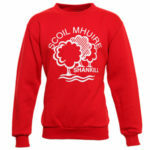 The children must wear either the tracksuit top with the Scoil Mhuire logo or a plain navy top, with plain navy tracksuit bottoms and white runners. 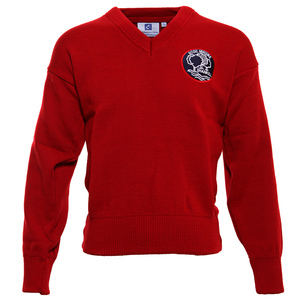 PLEASE PUT NAMETAGS ON ALL BELONGINGS – especially the jumpers. They all look the same and if your child loses one, we can usually only find it if the name is clearly marked on it.